Register using Seminar Enrollment Form page. Limited seating. Enrollment CLOSED April 30. Learn from professional raptor handlers how to properly manage, maintain, and train birds-of-prey in rehabiliation, for public education, and falconry. You won't find another program like it! Very affordable at only $45 donation per class! What are the age and experience requirements necessary to qualify for a rehabilitation permit? Raptor Management and Falconry Seminar: The Seminar offers a indepth study of the basics of raptor husbandry, medical management in rehabilitation, handling and training birds for falconry and/or public education. Modern and traditional falconry techniques are taught. The Seminar is open to anyone interested (no experience necessary), wildlife specialists, zoo and nature center handlers, and current or aspiring falconers and rehabilitators. Hundreds of people have attended over the years and have gone on to pursue their dreams. This Seminar is recognized for 35 hours towards continuing education required by many centers and zoos, and 20 hours towards a raptor rehabilitation permit. If you're a student at a college, ask your Dean/Instructor if this seminar program will earn credits for you as independent study. Structure: Sessions are held in the SOAR Center classroom from 10am to 5pm, one Saturday a month. Each session focuses on a specific topic, and offers easy learning in a relaxed and friendly atmosphere. Instructional aides are employed - videos, hands-on practice, topic outlines and hand-outs, self-tests, books, etc. Ample parking - picnic area - climate-controlled classroom - casual attire - coffee, soft drinks, water, provided. It is your responsibility to sign the attendance sheet for each seminar upon arrival. Bring your lunch and a notebook and pen. Each student will have the opportunity to handle raptors under the direct supervision of instructors during Seminars 2 through 5 (Seminar #1 attendance, and a signed hold-harmless waiver, is mandatory). Your Hosts and Instructors: George and Bernadette (Berni) Richter are state and federally licensed master falconers, raptor banders, breeders, rehabilitators, educators, and founders of SOAR. Collectively, both have over 60 years experience with a variety of raptor species, and have been hosting and teaching the Seminar program since 1988. Other licensed experienced falconers and interns will contribute often to the seminars as assistant instructors. Completion Certificates: Students who attend all five Seminar sessions will receive a frameable completion certificate. No make up classes or refunds for missed classes. Seminar students who miss sessions may attend those classes in a future Seminar to obtain their certificate. Enroll By Mail: To enroll for sessions of your choice, or all five, print out and return the SEMINAR ENROLLMENT FORM on the next page with the class donation ($45 per class). You will receive enrollment confirmation and driving directions to SOAR by e-mail before the seminar begins. We highly recommend that aspiring falconers attend all five sessions. Enrollment will be closed when we reach 40 enrollments or by the date above. Don't delay! We fill up fast! Enroll today! 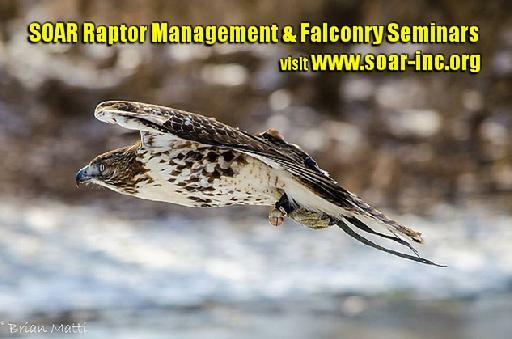 NOTE: The Raptor Management and Falconry Seminar program, and original materials, are the copyrighted intellectual property of SOAR. Reproduction-duplication-use without written authorization from SOAR is prohibited. DISCLAIMER: Seminar attendance and/or graduation is not an indication that a participant is qualified, knowledgable, or experienced enough to obtain a falconry, rehbilitation, or education permit, or for employment/volunteer work at a raptor facility. No guarantee is stated or implied.